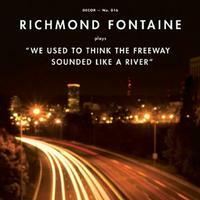 Richmond Fontaine play brittle and evocative alt-country with lyrics that draw powerful and sometimes troubling portraits of life along the margins of the contemporary American West. Equal parts Uncle Tupelo and Charles Bukowski, or Ryan Adams' Whiskeytown meets the gritty realism of Heartworn Highways, Richmond Fontaine is the brainchild of singer, guitarist and songwriter Willy Vlautin. The new album, seen as the band's most accessible yet, was produced once again by JD Foster (Calexico, Richard Buckner, Laura Cantrell), who was at the helm for the last three albums. Multi-instrumentalist Paul Brainard steps in with pedal steel, trumpet and piano and the core lineup of Willy Vlautin (guitars, vocals), Sean Oldham (drums, vocals), Dave Harding (bass) and Dan Eccles (guitars) remains.